Grownups have experienced the good and bad sides of life, giving practicality the upper hand in every aspect of your life, whether in study, work, marriage, or apartment furnishing. On the other hand, children are still green sprouts full of life and energy, so do not let them grow too early, and let them enjoy their time in a cheerful, bright room. Of course, you do not need to be advised to ensure the comfort of your child, but do not let all the safety and security instructions turn your child’s room into a cool, lifeless place. Now, let’s see how you can design such a vivid, playful, comfortable bedroom. For a relaxing, sound sleep full of dreams, get a colorful bunk bed which is most suitable for two or more agile kids, and a soft comfortable mattress. Cover the bed with themed bedspreads with floral or cartoon-character shapes. Then, give your children the space to study, play, and jump by keeping their ever-accumulating belongings in due storage spaces. For example, get them desks, shelves, and chests for their books, toys, and electronics. You can put their unnecessary items in the bed storage drawers or in a loft. Also, entertainment units for video games, stereo, television, etc., a mirrored dresser with drawers, and a closet with an organizer will keep the look tidy and spacious. But, ensure the sturdiness of these furniture items, and color them whether by painting or colorful stickers, letting a favorite theme run everywhere. Besides these items, let’s make some innovations especially in the walls, giving your children the exotic places they prefer. 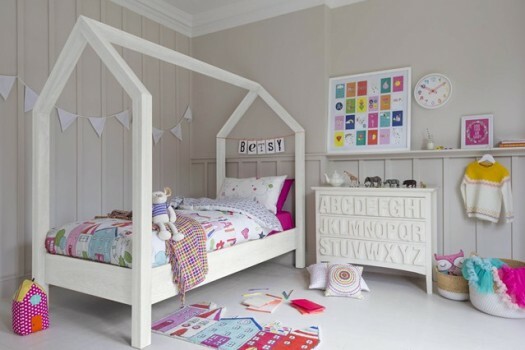 Children’s murals can give the child’s room such a further jump into somewhere else. For instance, you can create the photo-realism of a beech scene on the walls, whether of a blue sky meeting a roaring ocean with crashing waves, or of a rocky cliff looking at the sunrise and a ship in the distance. Or, if your child is interested in exploration and adventure, get him/her a mural of the outer space with images of the Earth, stars, constellations, and so on. Alternatively, you can give the walls one of the subtle colors, decorating them with digital posts displaying the images of your children, their friends, or their pets.